The stars brought life to the planet, and the stars destroyed it. … and a mysterious death. Is Calix also in danger? As part of a scavenging crew, he must salvage old technology they barely understand, crawling from outpost to outpost. But the sand hides secrets, and when it shifts, questions unasked and allegiances long forged are challenged. Just what is the sand hiding? 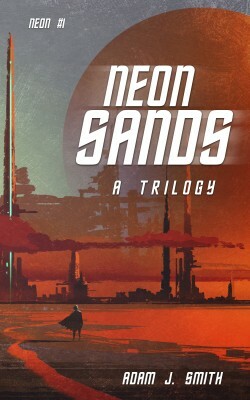 A sci-fi dystopia adventure in an inhospitable landscape, Neon Sands is the opening book in an epic series that will explore Man’s technological and innate potential, and the search for hope when all looks bleak.